Happy Thanksgiving to all of my American readers! If any of my readers will be travelling anywhere soon, I hope you have a safe journey. One of the tricky parts of travelling is figuring out how to adapt your daily routine to all of the new experiences that come with visiting another place. Between spending hours in airport or bus terminals while waiting for the next leg of the trip to begin and adjusting to a new climate, culture, or time zone, it can be challenging to stick to a fitness routine. 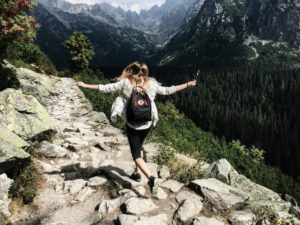 This post is going to talk about how to squeeze activity into whatever kind of trip you may have planned for the future. A year and a half ago, my spouse and I travelled to California for a beach vacation and extended family reunion. We couldn’t get a nonstop flight to our destination, so we ended up needing to book a layover. Our first flight took off first thing in the morning, and the second one wasn’t scheduled until the evening. What this meant was that we had several hours of dead time in the middle of the day while waiting for our connecting flight. It wasn’t enough time to go out and explore the city where our first plane landed, so I walked laps in the airport instead. It wasn’t a challenging workout by any means, but it did allow me to stretch my legs and increase my step count while waiting for the next stage in our journey to begin. Walking around can also be a more interesting way to pass the time than sitting for hours in the waiting room before you sit for even longer while on the train or bus. Checking out the hotel gym is a fantastic way to try out new equipment. You might discover that you like running on treadmills or that you prefer free weights to using a cable bicep bar. Alternatively, you might love gym machines and not find treadmills helpful at all. The only way to know is to try them out for yourself. To give another example of why you should take advantage of these amenities, I love to go swimming. If my apartment building had a pool, I’d practically be a mermaid. You’d better believe that I spend as much time as I can swimming whenever my spouse and I stay somewhere that has one. I’m not a huge fan of travelling in general, but this is definitely one of the perks of it. Body weight exercises don’t require any special equipment. Most of them are easy to memorize, and they can be done in your hotel room or in another small space as well. Due to all three of these benefits, I can’t recommend them highly enough if you’re looking to include some strength training sessions in your routine while you’re away from home. Some of the exercises in the link above are already part of my strength training routine. The next time I go somewhere far from home, I’m looking forward to creating a hotel-friendly workout that can be done using only my own body as resistance. You don’t have to go to the gym to improve your fitness. There are so many other ways to exercise, and many of them can be valuable forms of entertainment in and of themselves. Several years ago, I went hiking with my youngest brother and some other relatives while on a family vacation. He was a much more experienced hiker than I was, so we picked one of the easier trails and started walking. There were many things I loved about that trip, but that hike remains one of my favourite memories from that time period. It had been ages since I’d been surrounded by mountains, and even longer since I’d hiked around in them. We noticed a few subtle signs of the animals who lived there, from holes in the ground where snakes lived to the sound of birds singing in the bushes. While we weren’t actually that far away from the road, I was slightly surprised by how quiet the world is when you can’t hear any cars driving by or people having conversations just out of earshot. It was an incredibly peaceful experience. Spending time with my brother was also a blast that day. We’re two of the quietest people in the family, so I relished the chance to listen to whatever he had to say while we hiked. One of the things I like the most about visiting my other brother and his family is all of the playtime that happens with them. It’s not limited to the kids, either! From playing catch with my oldest nephew to going swimming with everyone, we found so many active ways to spend time together that I didn’t bother doing a formal workout on those days. Running around with them was all the exercise any of us needed. Now that my nephew is a proud big brother, our family reunions are only going to be more active and playful in the future. I’m going to be completely honest with you here. My workouts vary quite a bit when I’m travelling, and I don’t always meet my fitness goals. Some days could be full of more activity than I’d typically do back home, but others are more sedentary due to the kinds of activities the extended family chose for that particular day. Vacations are a time to relax in whatever way you see fit. Don’t worry if working out doesn’t fit into your plans for a particularly busy day. Missing one session isn’t going to matter in the long run, especially if that short time away energizes you. I know I miss my workouts when I’m not able to squeeze them in. The longer I go without them, the stronger my urge becomes to get back into old, familiar routines again.